A bacterium living in the icy-cold waters of Antarctica manages to survive by gripping on to the ice surface. The protein used by the bacterium to do this—a kind of extendable anchor—has been detailed by a group of researchers from Eindhoven University of Technology (TU/e), Queen's University (Canada) and the Hebrew University of Jerusalem (Israel). Quite special, because at 600 nanometers, it is one of the biggest proteins for which the structure has ever been identified. Useful too, because knowledge about how bacteria attach themselves is helpful if you want to prevent this, for example, in pathogenic bacteria that grip on to human cells in a similar way. It had always been thought that this protein was contained in the body of the Marinomonas promoryiensis bacterium and helps prevent the bacterium from freezing in the icy-cold waters of Antarctica. 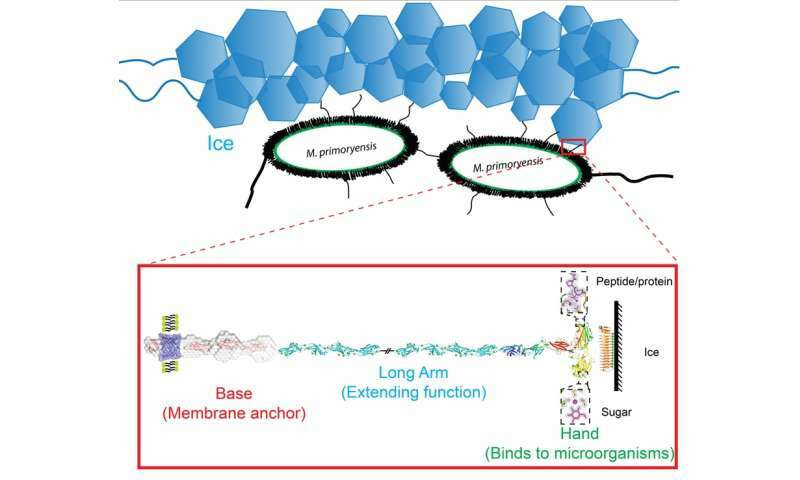 Until a few years ago it was discovered that this protein, called MpAFP, actually lies on the surface of the bacterium, operating as an 'adhesin', a kind of anchor to grip on to the surface, in this case the ice surface above the water. The researchers, led by Dr. Ilja Voets (TU/e) and Professor Peter Davies (Queen's), have now detailed the whole structure of this protein in a publication in the journal Science Advances. "This is a first for such an adhesin," says primary author Shuaiqi Guo (Phil), who undertook this study as a PhD student in Canada and has been working in Eindhoven since then. "Moreover, it is one of the biggest proteins ever to be detailed. At a length of 600 nanometers, it is a giant compared with most proteins of between 2 and 15 nanometers in size." Due to the huge size a different approach to normal was needed. Proteins are often crystallized—solidified in the same configuration—so that their structures can be determined using x-ray diffraction. "We chopped up the protein into five parts and studied it using different methods," Voets says. "Apart from x-ray diffraction, we also used x-ray scattering, a specialist field of ours in Eindhoven, and nuclear magnetic resonance." Then they put all the pieces together like a jigsaw puzzle. They discovered that each piece of the protein had its own function. 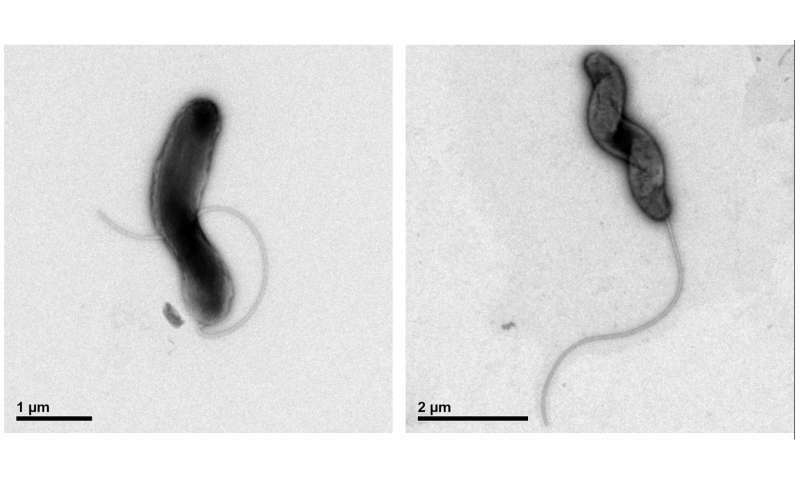 And that the protein could help the bacteria survive very well in these extreme conditions, although differently than thought. The protein is able to bind to 'diatoms', organisms in the water that photosynthesize the oxygen the bacterium needs. Thanks to this binding, these organisms stay at the surface of the water where there is most light—in a symbiotic relationship therefore. One of the possible applications of this work is the development of methods that ensure that bacteria cannot actually grip on to certain surfaces. "For example, we saw that the actual 'gripping' happens with a very small part at the extremity of the protein," Voets says. "Pathogenic bacteria attach themselves in the same way to human cells where they cause infections. Now that we know how they attach themselves, we should be able to find a way of preventing this."